The C&O Canal Trust is rehabilitating Swains Lockhouse at Lock 21 to become the newest addition to the Canal Quarters program. 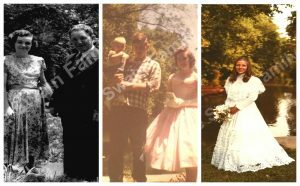 Bert Swain, who lived at Lock 21 from 1957-1980, generously shared his family memories and photos for this post. 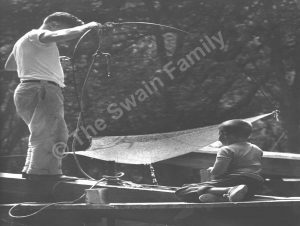 The Swain family has a long history with the C&O Canal, beginning in the nineteenth century when several family members worked on its construction and progressed to owning 15 shipping boats. Bert’s grandfather, Jesse “Pap” Swain, was a canal boat captain, shipping whatever goods his clients hired him to haul, and would sound a bugle to alert each lock that his boat was approaching. Bert’s father, Robert, and most of his fathers’ six siblings were born on canal boats. Bert says it was devastating when the canal transitioned to company-owned boats, putting the family out of the shipping business. But the Swains proved resilient, moving off the water and into lockhouse 21 in 1907. They were paid $22 a month in season and $11 in the off-season to tend the lock. Their income was supplemented through farming in the cleared river bottom area (now the hiker-biker campsite) and Jesse’s job driving the Potomac Elementary School wagon. 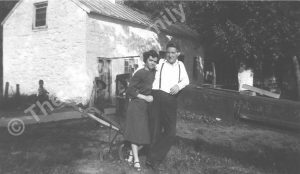 After Jesse passed away in 1939, Robert and his wife Virginia stayed at 21, living the rest of their lives on the lock. Virginia and Robert Swain, with hand plow and family in background. Photo © The Swain Family. The canal closed to canal boat traffic completely in 1924, again leaving the Swains without a livelihood. 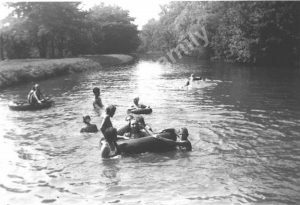 Once again, they reinvented themselves to embrace the canal’s new status as a recreation destination, leading guided fishing tours; renting boats, canoes, kayaks, and bikes; and running a concession stand. They increased their inventory by building fiberglass canoes, catching minnows for bait, and, as time permitted, crafting lead sinkers. Bert remembers fishermen coming by the lockhouse at 4:00 a.m. to purchase bait. There was always work to be done at the lock with family and friends pitching in. Frederick and Bert on the lower lock wall dipping minnows to sell as bait. Photo © The Swain Family. Amenities in the lockhouse were spartan, and Bert’s older siblings had a challenging childhood. His older brothers and sister grew up without electricity and plumbing, and with only a wood stove in the kitchen for heat. The upper floor of the house had latticed holes in the floor to allow the heat to rise. Despite this, their mother’s bedside water glass was ringed in ice each winter morning. Bert’s older sister recalls studying for school by oil lamp and candlelight. Electricity and telephone arrived in 1952, and indoor plumbing in the early 1960s. Previously, water came from a spring with a gravity-fed pipe that led into the kitchen. 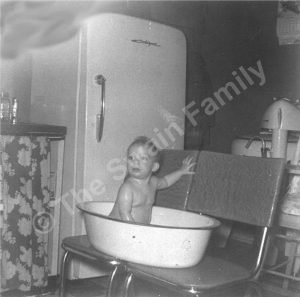 Bert as an infant at bath time. Before indoor plumbing arrived in the lockhouse, spring water had to be heated for bathing. Photo © The Swain Family. Social life at the lockhouse was open and welcoming. According to Bert, you never knew who might show up for dinner—family, friends, or past visitors. 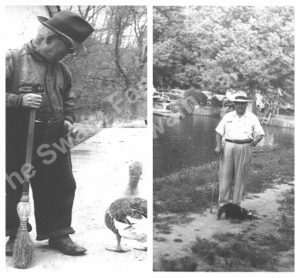 Robert Swain often had overnight guests and was a welcoming host, part of the canal’s communal culture. During warm weather, the canal was used for swimming and moonlight cruises. The children would also swim out to a sandbar in the river. When the canal froze, the family had skating parties with a campfire on the side and lanterns lighting the ice. They enjoyed hot dogs and hot chocolate and, with the moon shining down, would often skate until the wee hours. Once Bert and his brother skated all the way from Swains to Pennyfield lock (a distance of about 3 miles)—never encountering another person, only smooth, pristine ice. In addition to farm animals like chickens, turkeys, and a mule, Jesse had a beloved goose, Jimmy, who would follow him everywhere, including on his elementary school wagon route. Jimmy lived to be 27 years old and died just two days after Jesse passed away, most likely of a broken heart. During the 1950s and 1960s, Bert remembers several of the neighborhood dogs would roam freely up and down the towpath, needing to be retrieved after catching a ride up to Paw Paw, WV, and down to a formal dinner party in Georgetown. The Swains’ neighbor, Mr. Baker, would often visit with one of his pet skunks. 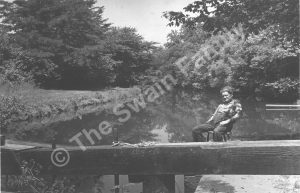 Like all family homes, Lock 21 holds special memories for the Swains, like when Robert and his son-in-law caught bull frogs intended for a frog legs feast. His son-in-law thought they would make a fine meal, but upon returning the next evening, he found that Robert had let them all go because he enjoyed hearing them sing around the lockhouse. 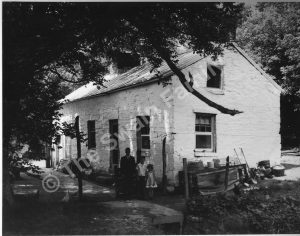 The family often gathered in the front yard of the lockhouse for large meals, including Thanksgiving, and would be joined by friends who had come to know and love them over the years. Many high school graduations parties for immediate and extended family members and friends were held there. It was a perfect place for entertaining. Bert and his wife Amy even held their wedding rehearsal dinner in the front yard. You can learn more about the Swains Lockhouse project here, and read two more blog posts by Bert Swain: Changes at Swains and Fighting Floods at Swains. 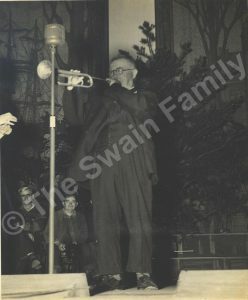 NOTE: The photos in this post are property of the Swain family and may not be used or reproduced without permission. Christine Rai is a college professor in the Washington, D.C. area with a passion for culture, food studies, and experiential learning. She blogs about food, travel, and teaching at www.christinerai.com.